Alternating current motors can be controlled by classical methods (drivers) such as direct-online control, autotransformer control, star-delta control or line reactor control, however classical control methods are not the most efficient methods for control and they are currently being replaced by modern electronic methods such as softstarters and variable speed drives. Modern electronic control methods occupy smaller spaces, provide more functionality than classic methods, increase machine lifetime by decreasing thermal stresses on the machine and most importantly provide higher motor efficiencies which are reflected in great economic savings in operating costs. Observing the system from the motor perspective, it takes a rotating effort provided by the motor to turn the fan of the blower from rest to rated speed, the motor has to provide the rotating effort by a torque greater than the breaking torque of the fan and its moment of inertia, besides the motor torque should also be capable of reaching the rated torque where the fan rotates at its rated speed in a starting time which is adequate enough to prevent the motor from overloading. 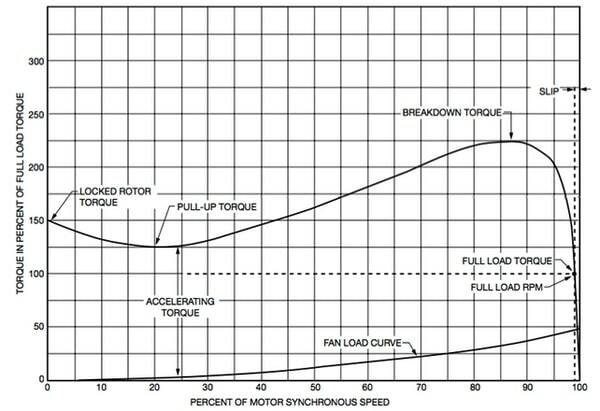 A motor which has a torque equal to the retarding torques will stall in a state referred to as the locked rotor torque, the breakdown torque is the maximum torque a motor can provide, and most importantly the rated (also known as nominal) torque is the target torque the motor is designed to provide and should match the rated torque of the fan, thereby rotating the fan at rated speed. When the motor is rotated without any load attached to the shaft (no-load) it rotates at full speed with zero torque. 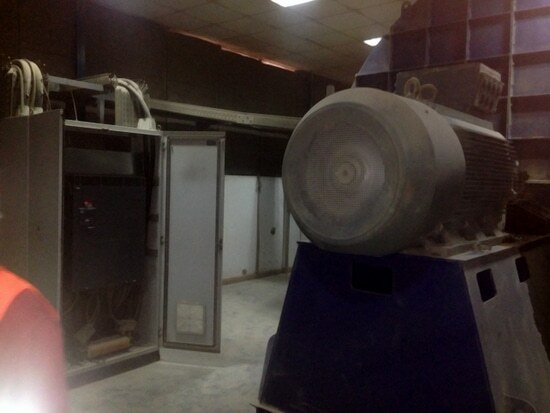 From the load perspective, the motor is a driver which should be capable of matching the characteristics of the fan. The fan has a quadratic torque-speed characteristics which starts from the rest position of the fan and increases until reaches the rated point of speed, torque and power. 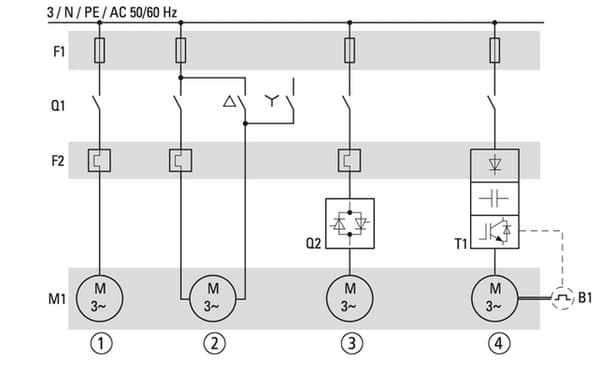 All load drivers (controllers) mentioned above can basically be used to reach the nominal point for fan operation, however a variable speed drive (also known as variable frequency drive VFD) is capable of reaching the same point efficiently, without the inrush power consumed in other classical methods, in addition to that it is capable of controlling the speed of the fan by varying the ratio of voltage to frequency of the motor. A good example of controlling the fan efficiently is by using an automated closed loop control system, where the temperature sensors send signals to a controller (e.g. PLC) and where the control controls the voltage-frequency ratio of the motor using a VFD, this example allows real-time adjustment of the amount of energy being fed into the motor, thereby reducing energy consumption. There are several methods for controlling ac motors, each method has its merits and disadvantages, however they can be classified into classical and modern, modern ac motor control methods are much more efficient. An efficient drive system allows the ac motor to match the speed-torque characteristics of the load it drives, for the case of a blower the load follows a quadratic torque-speed characteristics. A closed-loop automated drive system could save alot of energy. Have you ever worked on a project involving Industrial Blowers and Variable Speed Drives? If you have, please share your remarks in the comments below! or copy this trackback: http://engineering.electrical-equipment.org/energy-efficiency-motors/control-of-industrial-blower-using-variable-speed-drive.html/trackback from your own site.